The Amish Warner Parsons Chair exhibits luxurious versatility as it lends itself to support either a modern or Old World style. Attractive and inviting, these elegant chairs come in a variety of fabrics to reflect your personal style. Bring out your best china and crystal as you prepare for special occasions, or enjoy a casual meal for two. 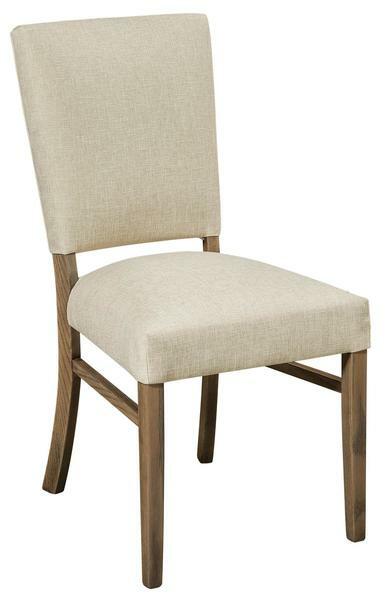 Shown here in Brown Maple wood with Tuffet fabric, the Warner Parsons dining chair is ready for you! Consider our Amish Martina Dining Room Chair for another option. Shown in Oak with FC 15443 stain. Seat shown in C2-11 Canvas fabric.